This is the first game in the Super Smash Bros. series. 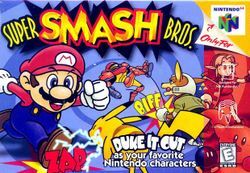 For other games in the series see the Super Smash Bros. category. Super Smash Bros., an innovative fighting game by Masahiro Sakurai of Nintendo, is one of the top 40 best selling console games of all time (2.5 million copies by 2004). As a fighting game, it revolutionized its genre by introducing the "platform fighter" concept, where 12 different Nintendo characters (up to four at a time) battle on one of nine platforms; if characters are thrown off, they die. Instead of having health bars, characters' damage percentages are increased as they are hit, and the more damage they have, the further they fly from a given attack. There are many different gameplay modes for both single and multiplayer, and while single player is very deep because of the amount of different challenges, multiplayer is what the game excels at. Most recently, it has been released for the Wii's Virtual Console in Japan on January 20, 2009, in Europe and Australia on June 12, 2009, and in North America on December 21, 2009. This page was last edited on 6 September 2015, at 20:22. This page has been accessed 68,792 times.